"If you like the video, keep mashing that 'I need an apothecary' button!" 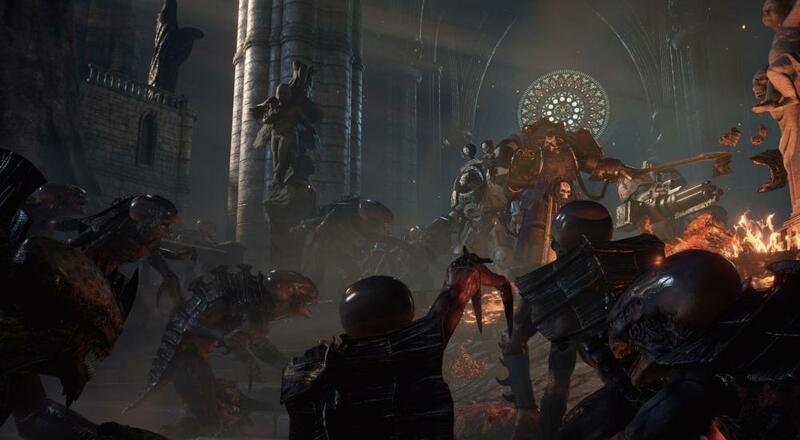 It's been a year almost to the day since we last checked out Space Hulk: Deathwing. At that time, the game had received just a few of the updates that would eventually be bundled together in the "Enhanced Edition." That version was released this past May for PC and PlayStation 4 so we decided to hop back in and see how things were looking these days in the grim dark future (aka 2019). Revamped "Special Missions" (i.e., Co-Op) mode - at launch, this mode let you play through the single-player campaign missions with friends, provided you had cleared the mission on your own. It was a real bummer. Now, missions randomly generate objectives to complete as well as enemy spawns. Character Progression - your co-op classes now have permanent progression outside of the levels they earn during a mission. Whether you win or lose, every mission you play you'll get some XP that goes towards your overall "account level." Every time you level up, you'll get some in-game currency (Renown) and some item (e.g., new armor, a banner, perks, weapon mods) that can be used to customize your class of choice. The in-game currency can be spent to acquire specific things for a class, but it's worth noting that you're only unlocking it for that class (i.e., buying an extended magazine for your Apothecary's Storm Bolter only unlocks it for the Apothecary and no other class). New Enemies - some new Tyrannids have infested the halls of Olethros and you'll quickly learn to hate the purple glowing ones. All of those enhancements really do make the co-op portion of the game feel like a whole new affair. There's something you can sink your teeth into now. It's not quite at Vermintide 2 levels, but it's close. I really hope there's a sequel to this game and that Streum On is able to improve upon the (now) solid framework established with this Enhanced Edition. Space Hulk: Deathwing - Enhanced Edition is available on PC via Steam and the PlayStation 4. Four player online co-op is supported in the "Special Missions" (Multiplayer) Mode. If you previously acquired Space Hulk: Deathwing on the PC, then you should have the Enhanced Edition automatically in your Steam Library for free as a separate entry/install.